Dreams really do come true at Mountain Waters Lodge! This is a custom built home, first time on a rental program. The home was built before restrictions were implemented that now prevent from building so close to the water. Backing up to 100,000 acres of Wildlife Management, your back yard is a paradise to behold! You are steps from hiking trails (Bear Creek & Pinhoti) where hikers and bikers alike, come back time and time again because of the beauty and the abundant nature in this area. This 4,000+ Sq.Ft. home provides the perfect retreat for families, friends and leadership groups needing to find a place that provides serenity, beauty and relaxation. The huge Great Room boasts a 17' ceiling with a masonry wood burning fireplace, ceiling to floor windows and a 55" Flat Screen TV. There is even a piano for those with the talent to play. Reclining furniture allows for a relaxing experience while watching a great movie with a big bowl of popcorn. Upstairs, you'll find another living room with seating and a large flat screen TV, the perfect place for the kids to watch their own movies, giving the adults some space of their own. The 2 large, screened in porches overlooking the creek is a favorite place to enjoy the beauty of the outdoors, the fresh mountain air and the sounds of the rushing creek. Walk out on the huge backyard deck where you'll find the large luxury hot tub, seating and dining area, all overlooking the creek of course! Grab the marshmallows and cross the little bridge to enjoy a campfire at the firepit. On a clear night, these sky's often delight with some of the brightest stars to be seen. The creek is a favorite spot for children and adults alike to pull off their shoes and refresh in the cool mountain waters. It's quite possible to spend hours here, exploring, looking for gemstones or other items of interest that may tell a story of times past. There is a game room which boasts a pool table as well as a ping pong table. Another main feature of this home is the incredible custom kitchen. Truly a Chef's delight, the exotic granite counters, all stainless KitchenAid appliances, large cook/work island with 5 burner (Wolf) gas stove, provides the perfect environment to prepare and enjoy a variety of meals. Open to the dining room with a large table that seats 6 and a breakfast bar that seats 5, there is plenty of room to enjoy meals as a family. The gas fireplace in the dining area adds ambiance to the dining experience on a cool day in the mountains. The King Master located on the main level has it's own private bath with walk in shower and large tub. There is a Queen bedroom on the main with access to a screened in porch, and 2 more Queen Bedrooms on the upper level both with their own private baths. This home has so many places that one can "escape" to for some alone time with a good book, or to focus on the important things in life that we sometimes take for granted. Mountain Waters Lodge provides the perfect location to renew the spirit, relationships, etc.. So....if you are in need of a place like "Mountain Waters Lodge", give us a call now or book directly from our website to experience this incredible mountain home! *Buddy's Creekside Bungalow and Yogi's Hideaway are both within a short walk from this home making it a great place to host family reunions. *NIGHTLY RENTAL RATES ARE BASED ON 8 PEOPLE. THERE IS A FEE OF $15 PER PERSON PER NIGHT FOR EACH PERSON OVER 8 UP TO THE MAXIMUM QUANTITY. WE DO NOT CHARGE A PET FEE FOR OUR PET FRIENDLY CABINS. Amazing! I am in love with the house, it is paradise. Everyone in our group loved staying at Mountain Waters Lodge. It was everyone's favorite house that we've stayed in. It was roomy, clean, and as nice as the pictures. The beds were comfortable, and the creek on the property was very nice. Beautiful location. Excellent customer service!! Extremely fast response time. beautiful property with great location to the state park and hiking areas. I like the fact that you sanitize the hot tub after each stay and the outdoor grill was clean and ready to use. Great experience. thank you and the owner of the property for a relaxing stay. This place exceeds all expectations. As soon as you pull off onto the gravel road that takes you to the home, you know you're in the right place. The winding creek in the backyard is probably the most peaceful thing, outside of the ocean, that you can relax by. You basically never have to be indoors when staying at this home. With three screened in porches, you feel like your outside all the time. I went with my band after a busy month of recording and performing. It was just he vacation we needed. The home is well equipped with everything you need to make it a good, refreshing stay. I plan on making it back to this property as soon as possible! Could not find a better place to stay. Everything was perfect. Great place for couples. We will return! The property accommodated our family vacation wonderfully. We had several children raging in age from 1-13 and there was plenty for them to do right there at the cabin. The kitchen is amazing and it was easy to cook and enjoy. There was plenty of room so we didn't get each other's way. It was an overall great experience and I can't wait to enjoy another vacation soon. Very nice Our family had 10 of us that went, and had a great time. Very nice and would recommend it to anyone. It was very quiet and relaxing. Lots of small fish on the pond and the small creek was nice to listen to just feet from the decks and porches. Great cabin up in Cohutta wilderness! 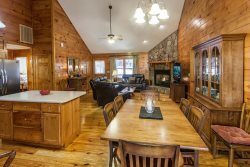 ★ ★ ★ ★ ★ We rented this cabin for a corporate retreat and were really impressed with how nice the cabin was along with how easy it was to access trails like Bear Creek and Pinhoti 1, 2, 3 for quick hikes and mountain bike rides. The directions were spot on for finding this place in the dark on our arrival night. Much appreciated given the lack of cellular reception in the area. Internet onsite was sufficient for the work we needed to get done after-hours and the bedrooms were all incredibly comfortable. Cant wait to get back here again! Amazing!!! ★ ★ ★ ★ ★ Beautiful home & property. Wish we never had to leave. Amazing house! ★ ★ ★ ★ ★ The house was very clean when we arrived. Towels, sheets, blankets, etc, were there. The kitchen is very large and so comfortable. You can find everything you need. Everything is in good condition, including refrigerator, oven, stove, etc. The house is very confortable, in the middle of nowhere. Perfect place to find peace and silence. It is easy to find if you carefully read the instructions. Family room has space for each all, there are many books and board games to spend your time. Everything was as expected. There is a book with all you need in case of emergency, near activities, restaurants, super markets, etc. We strongly recommend this house for a family vacations, we spent a very good time. I went w/ several couples for an awesome week-end. The house is huge with all the amenities. It is a located on a rippling stream and has a small pond on the lot as well. Lots of room inside and outside for any activity. The kitchen is fully equipped and beautiful.